What kinds of special educational needs might the children at Maryvale Catholic Primary School have? Who are the best people to talk to in this school about my child's difficulties with learning/Special Educational needs or disability (SEND)? What are the different types of support available for children with SEND at Maryvale? What do I do if I am worried about my child's learning in school? How is extra support secured for children? Who else might my child have support from, professionally at Maryvale? How is the curriculum tailored to meet the needs of SEND children? How do the school monitor the effectiveness of provision for pupils with SEN? What support is there for me as a parent of a child with SEND? What other activities are available for pupils with SEN in addition to the curriculum? How was Moses eloquent and truthful? What is eloquence and truthfulness? It is fantastic to see everyone back in school and we welcome new staff and pupils to our school community. You may have noticed some changes! 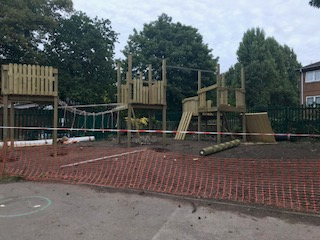 The new playground equipment is currently under construction and should be ready to use from the 17th September. Thanks to the PTA for funding towards this project.